My friend Mo, who owns Pipsticks and whom I’ve written about before (here), is expecting a baby girl (her fourth baby!) any day now. I was over at her house last week and asked to see her baby’s nursery… because honestly, isn’t there something so magical and exciting about a newly prepared little space for a baby? The perfectly clean sheets, the soft blankets, the miniature baby diapers… all just waiting for a baby to arrive! Oooh the anticipation! 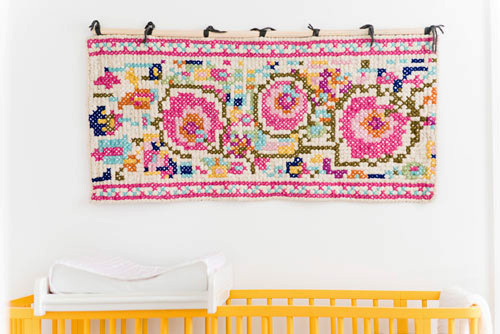 I love the way Mo decorated the space, and I especially love her idea of hanging a colourful rug up on the wall above the cot. Mo told me she used a big yarn needle to loop pieces of chunky, grey yarn through the rug to attach it to a cheap, unfinished wooden dowel (which she picked up at her local DIY store). She spaced the yarn evenly, starting from the center, and made about 4 loops around the dowel at each spot. She then hung the dowel from the wall with nails. The whole thing took her only 15 minutes and instantly transformed the space. How clever is that?! 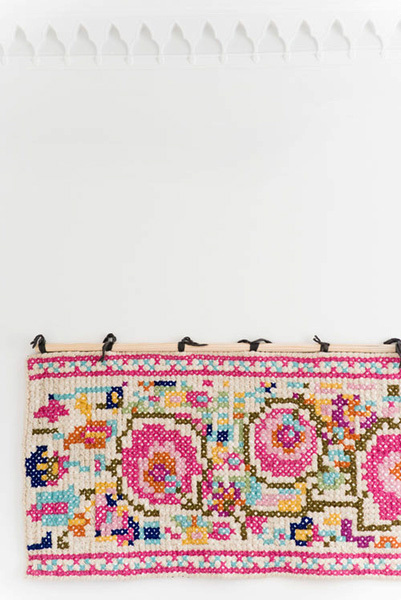 She bought the rug from Oliver Bonas which has a small, but nice selection of rugs. 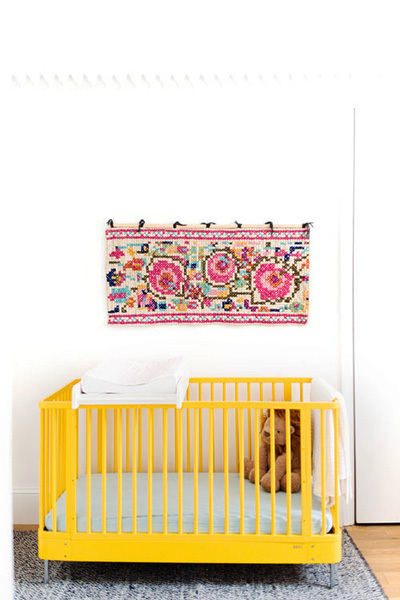 I love the vintage feel of the one she chose and think it looks so perfect above that yellow cot! What a lovely idea, thanks for sharing Courtney!